Penang is an island that is off of the northwestern coast of Peninsular Malaysia. It's a popular island with tourists because of its rich history and fascinating culture. Penang is not known for its beaches, but instead has great restaurants, cafes, and street vendors. Visitors usually choose to stay in the main city of George Town. The island, and George Town in particular, are known for their food culture. The island is said to have one of the best food scenes in the country. There is no shortage of affordable accommodation in the area. 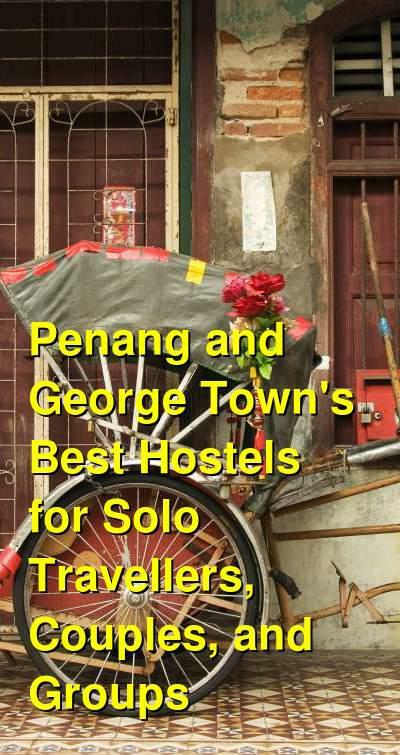 Most budget guesthouses and hostels are in George Town. Chulia Street, Muntri Street, and Love Lane are all known for their budget accommodation. If you want something a little fancier, there are several nice resorts along the beach outside of town. How much do hostels in Penang cost? A good hostel for solo travellers, couples, and small or large groups. Ryokan Muntri Boutique Hostel is located in the middle of George Town and sits on the quiet street of Lebuh Muntri. It's walking distance to many great cafes, bars, restaurants, and street vendors, so it's a great place to base yourself if you want to experience Penang's excellent food scene. Both Little India and China Town are also very close by. This hostel is a favorite for backpackers to the area. It's popular with solo travelers or those in groups and whether you're with a small group of friends or a larger more organized group, then this is a good place to stay. There are 58 dorm beds in total and four rooms with double beds. Dorms are split into four and six bed dorms and both co-ed and female only rooms are available. The hostel is a fun place to stay with a friendly staff. There's wi-fi throughout and there's a game area where many guests enjoy hanging out. There are also light snacks available throughout the day and bikes are available for use if you want to explore outside of George Town. Magpie Residence is an affordable option that's also conveniently located in George Town. 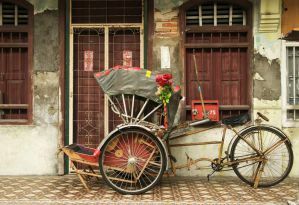 There are many of the area's top attractions nearby including China Town, Little India, Kapitan Keling Mosque, Fort Cornwallis, and the Campbell and Rope Walk Street Feal Market. The hostel is really more of a hotel so it doesn't have the social atmosphere that you might expect at a typical backpackers hostel. Still, it has affordable rooms that are a good quality in a good location. There is a nice lounge on the ground floor that is just off the lobby. There's also an area where you can prepare food. The hostel has several dorms available. There are both two and eight bed co-ed rooms as well as private doubles and four bed family rooms. All of the private rooms have ensuite bathrooms. House of Journey is a favorite hostel in George Town. It's located in the historical heart of the city and is very close to everything that you might want to see and do. Nearby you'll find a variety of restaurants and bars and there are plenty of street vendors in the area. It's the perfect location to base yourself during your time in Penang. There's a nice common area where guests enjoy hanging out and there's a bar that serves drinks. Guests can use the game tables or surf the web with the free wi-fi. The staff can also help with any travel arrangements. The hostel has both private rooms and dorms available. There are four bed female only private rooms as well as six and sixteen bed co-ed dorms. Private rooms are either twins or doubles. The Frame Guesthouse is located in a three story shophouse that has been redesigned to meet the needs of travelers. It is owned by the same group that owns Old Penang Guesthouse and the 80's Guesthouse. The hostel is well located near the historical part of George Town and is easily accessible near many of the main tourist sights. The hostel has a variety of amenities available to guests including free breakfast, free wi-fi, hot showers, free drinking water, satellite television, movies, and coffee and tea. There are both private rooms and dorms available. Four and eight bed dorms are perfect for travelers on a budget. There's also a four bed female only dorm. Private rooms are either doubles or twins and guests can choose between shared and ensuite bathrooms, depending on the budget and travel preference.